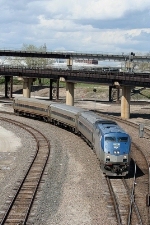 Description: The Westbound Pennsylvanian with Amtrak 90 and five cars coming into Daylesford. 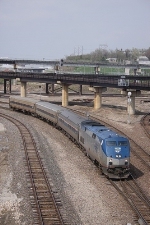 Description: Amtrak 90 on the point of the Pennsylvanian. Description: The Westbound Pennsylvanian makes a slow pass through Daylesford. Description: Amtrak P42DC 90 leading westbound train 43, the Pennsylvanian, at Daylesford. Description: Pennsylvanian scoots westbound by Narberth Station on the Keystone Corridor as leaves are starting to color for autumn. 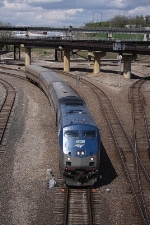 Description: Amtrak P42DC 90 leads 04T (Pittsburgh Pa. to New York Ny.) to a stop at the Altoona station on track 2. 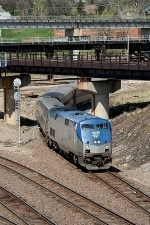 Description: Amtrak train 43, the westbound Pennsylvanian, pulls into Altoona station. Description: The Pennsylvanian departing Altoona station. Description: Amtrak P42DC #90 leads the westbound Pennsylvanian past Bryn Mawr, Pa at 12:56PM. Description: Arriving Harrisburg station, my apologizies for the dirty cab car window! Description: AMTK Engine 90 resting in the yard. Description: 575 is joining 10 colleagues in the engine area, and parking in front of GP38 720. Description: The Pennsylvanian rolls east. Description: Amtrak #90 on eastbound train P030, "The Capitol Limited" passes under Norfolk Southern tracks in Shenandoah Junction, WV en route to Washington DC. Description: Amtrak / Coast Starlight. 96 northbound approaching the Lewis Rd / CA-34 overpass.